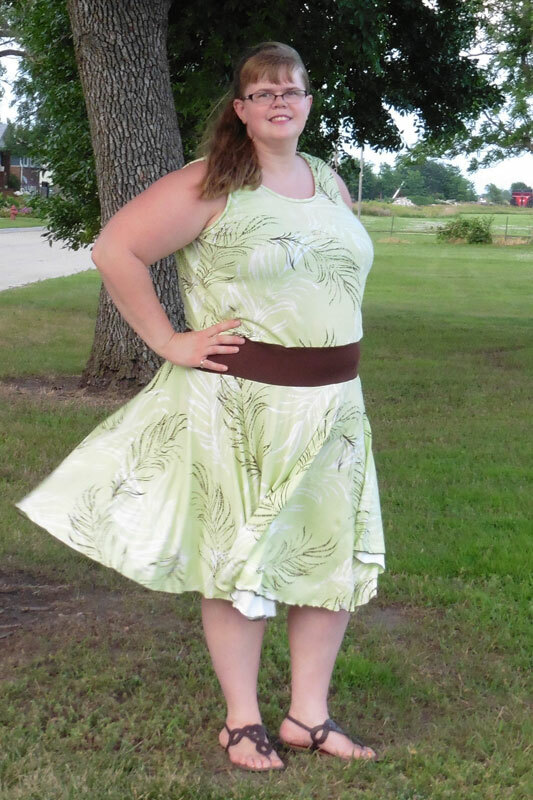 Hack: California Dress with Circle Skirt – Everything Your Mama Made & More! 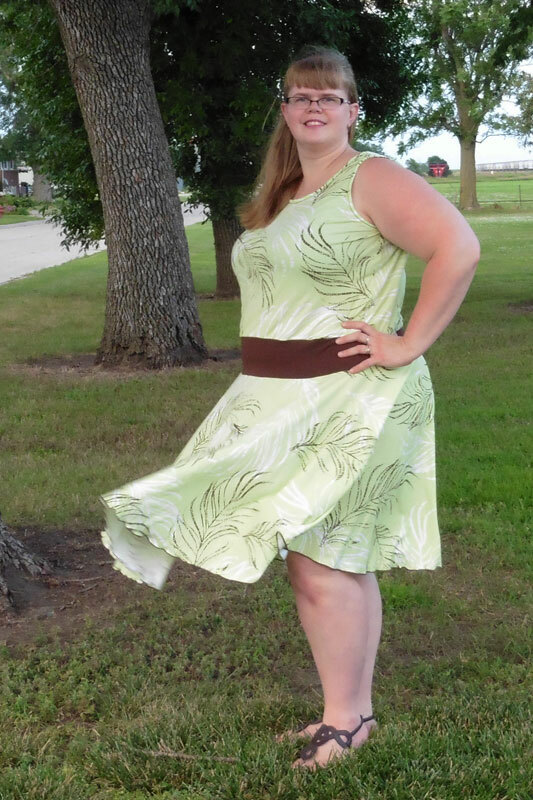 When I got this palm frond fabric, I knew it would make a great California Dress & Peplum. I thought the scale of the print looked perfect for a women’s maxi dress. As I was laying it out and preparing to cut it with the pattern, I kind of spontaneously decided to try a circle skirt hack! Before I could change my mind, I did the math (radius=circumference/2pi) and refolded and cut the circle. I used my own waist’s measurement for the skirt’s waist circumference and made my skirt 20 inches long and finished the bottom edge with a rolled hem on my serger. If you haven’t ever made/cut a circle skirt, this tutorial by Dana over at MADE is a great reference. I cut the California scoop neck bodice (for both front and back) down to the elastic waistline markings and assembled it as per the pattern. I chose to leave out the elastic casing and add a contrasting knit waistband instead. I used a piece of brown knit 4 inches wide and added a couple inches to the elastic cut chart measurement for the length. I sewed the short ends together (so it was a loop) and sewed the skirt to the bottom edge. I then gently stretched the top edge of the waistband to fit the bodice width as I sewed them together. I am so glad I had the idea and followed through because I think the California Dress circle skirt hack looks awesome! It is the perfect casually put-together look for summer! I love how you did this. I think I will try it . . . and coming from that is the utmost compliment!